Wales’ artistic community has honoured Godfrey Evans, the founder of West Glamorgan Youth Theatre Company. 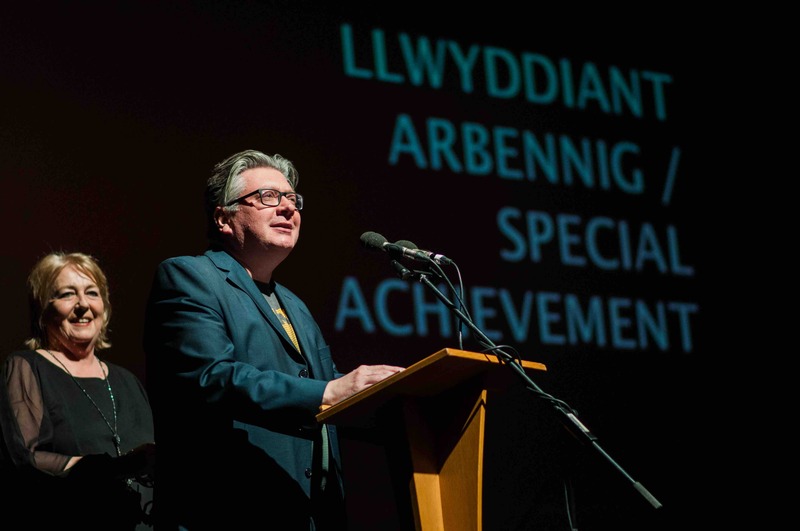 He was named winner of the Special Achievement Award in a moving and stirring citation by writer and director Simon Harris at the Wales Theatre Awards held at The Riverfront, Newport. Other former members include Wales Theatre Awards winners Matthew Bulgo, Christian Patterson, Karin Diamond, Gareth John Bale, and two times WTA winner Sophie Melville and Rosie Sheehy, who has been named Best Actress in the English Language in this year’s awards. Rosie Sheehy won the Best Actress in the English Language Award for her portrayal of Sonya in Theatr Clwyd’s production of Uncle Vanya. The show also won Best Production. 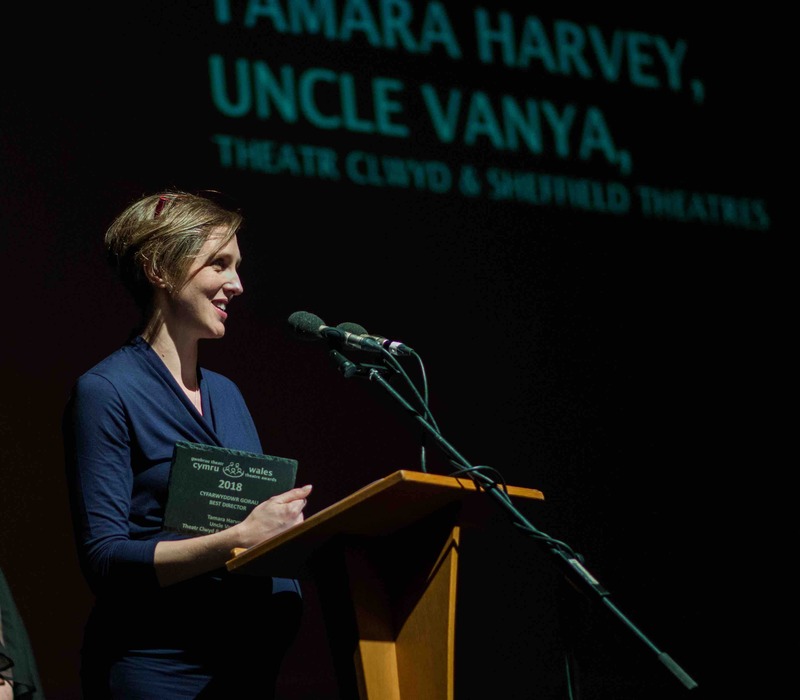 Theatr Clwyd artistic director Tamara Harvey received the third in a hat-trick of engraved Welsh slate trophies for the Mold venue, being named Best Director for her work on the Chekhov classic. The staging was a co-production with Sheffield Theatres. The North Wales venue also shared in the success of the award for Best Sound, which recognises composition, performance, expertise in music performance and sound design. Lucy Rivers was named winner for her show Sinners Club, which has recently completed a week at the Soho Theatre in London after touring Wales. Sinners Club is immersive gig theatre where the audience is invited into a live recording of a concept album by rock band The Bad Mothers, about the last woman to be executed in the UK, Ruth Ellis. The Gagglebabble show was a co-production with Theatr Clwyd and Cardiff’s innovative theatre space, The Other Room. The annual awards, which include four new categories, celebrate theatre, opera and dance created and performed in Wales in the past year. The Wales Theatre Awards recognise excellence in live performance, and the role of reviewers in the cultural life of the nation. 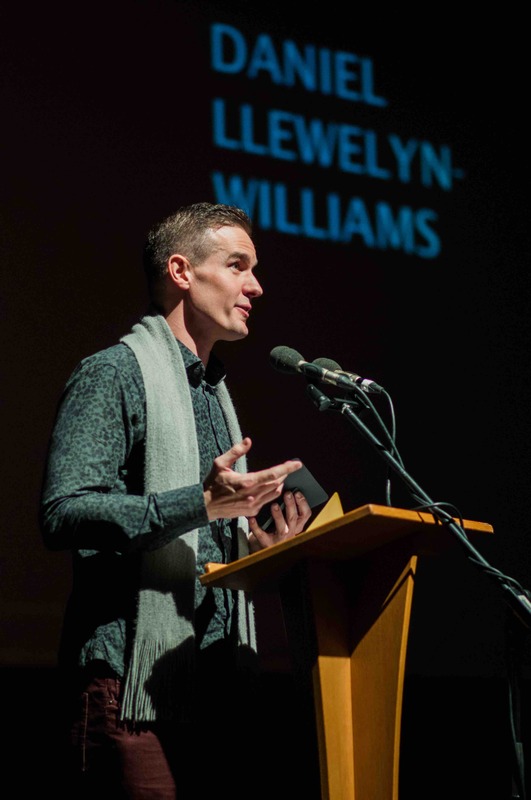 The awards are unique in not only being open to all reviewers in Wales to make nominations but are also independent of any public or arts organisation funding and run in tandem with Wales Critics Fund which gives professional mentoring to new reviewers, financial support to attend live performances and enables their work to be published. It is administered by a not for profit company Arts Awards Ltd which raises all funds through a membership scheme, advertisements in the programme of the Awards Show and donations. All work for the Awards and the Wales Critics Fund, including performers, presenters and administration, is voluntary. 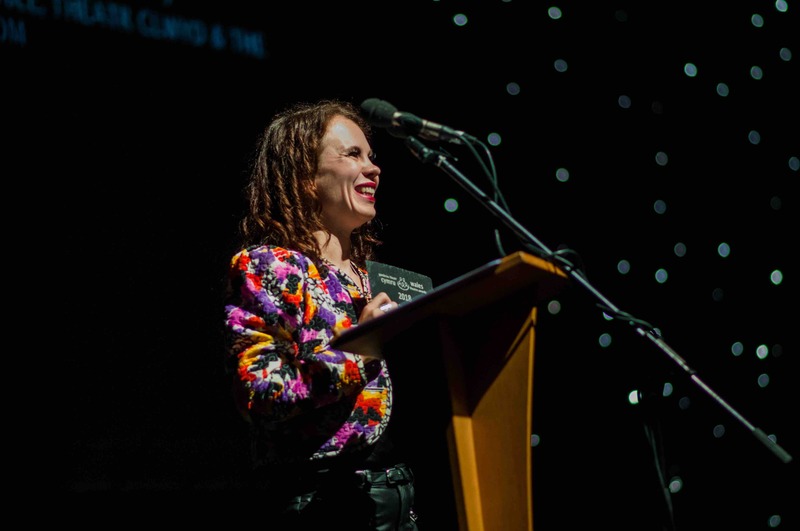 The shortlists and winners are decided by eleven of Wales’ leading reviewers whose expertise encompasses a broad range of performance genres in Wales and beyond, writing for a broad range of publications and publications at local, Wales and UK levels. There had been an open letter signed by 40 people calling for the Awards to censor the shortlists because some roles had not been performed by people of the same ethnicity as the characters they were portraying. Three members of the National Theatre Wales team who had been invited as guests, as no shows from the organisation had been selected for the shortlists, also politely contacted the event organisers to say that they while they would not sign the Open Letter they were unable to accept the invitations. While expressing from the stage that the Awards of course share concerns about diversity and inclusivity in the arts, the show, organised by journalists committed to defending both the freedom of speech and artistic expression, would continue unaltered. Rather, presenters, winners and judges alike called for artists to work together to achieve such laudable aims. There have been nearly 600 individual nominations for work from 73 companies, 130 shows and more than 222 individual artists. The Awards are run at no cost thanks to sponsorship from the host venue, the South Wales Argus, the University of Wales Trinity St David and the Royal Welsh College of Music and Drama. Advertisement income from the Awards Programme, which contained articles from Wales culture Minister Lord Dafydd Elis Thomas, international opera star Dennis O’Neill, writer Manon Eames, young director Chelsey Gillard, and new critic Sanaz Safari, along with Award Director Mike Smith, benefits the Wales Critics Fund. This unique Fund pays for mentoring of new reviewers, mentoring projects in schools across Wales, and gives financial help to enable freelance and students to attend live performances, be mentored in reviewing and have their work published The Fund is a membership scheme which is supported by all of Wales’ main theatres and arts organisations. It is run by a not for profit company, Arts Awards Ltd.
At a glittering Wales Theatre Awards Show at The Riverfront, Newport, winners shared the themes of community and team working, celebrating the existing diversity of the arts in Wales, as reflected by the winners, presenters and performers at the Awards Show, and recognising and encouraging the work being carried out by the industry to continue to widen participation and inclusivity. Winners also raised concerns over the financial challenges facing artists across the nation and that commitment to the right of young people to take part in the nation’s artistic life was being eroded. The packed Riverfront audience were entertained with new choreography by Darius James and Amy Doughty from Ballet Cymru’s new autumn 2018 collaboration with Cerys Matthews, A Child’s Christmas in Wales, performed by Ballet Cymru dancers Beth Meadway, Krystal Lowe and Daniel Morrison. 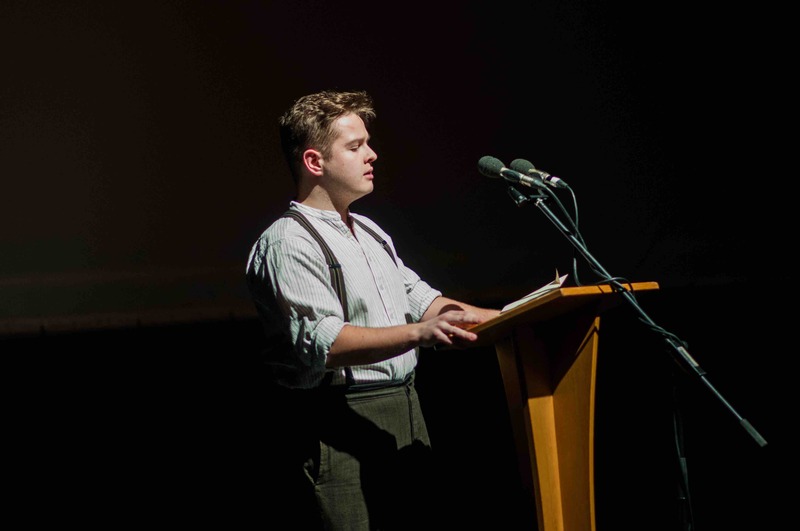 Daniel Llewelyn-Williams performed an extract from A Regular Little Houdini, Flying Bridge Theatre Ltd.
To mark the beginning of this, the centenary of the final year of the First World War, Sion Emyr recited Hedd Wyn’s poem Rhyfel (War). Ellis Humphrey Evans, better known under his bardic name Hedd Wyn, was killed during the battle of Passchendaele in 1917. Sion Emyr works with Mewn Cymeriad / In Character, taking one man / woman shows to schools presenting Welsh history. 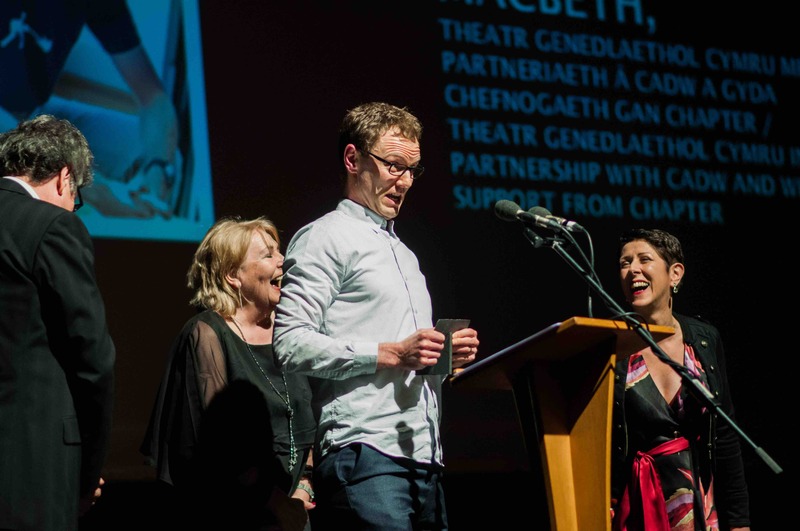 In the bilingual Awards, Wales’ national Welsh language theatre company, Theatr Genedlaethol Cymru picked up two awards for its ambitious staging of Macbeth at the iconic Caerphilly Castle. 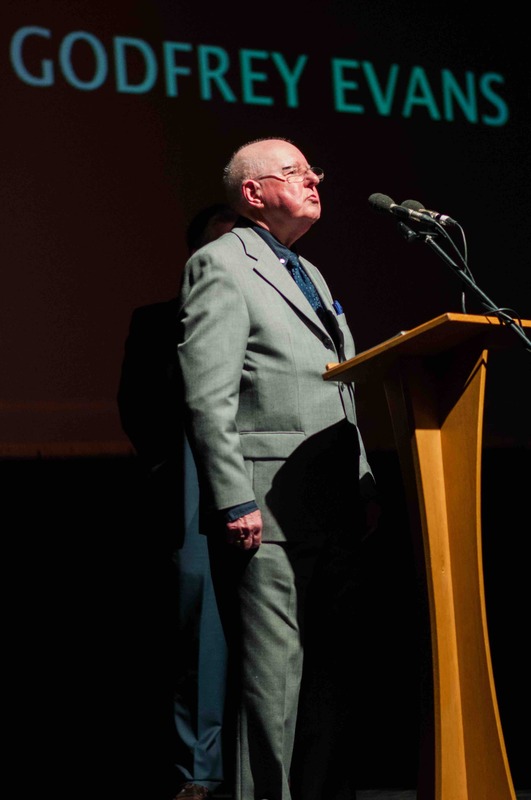 The Best Actor in the Welsh Language was won by Richard Lynch while Joe Fletcher was named Best Lighting designer. 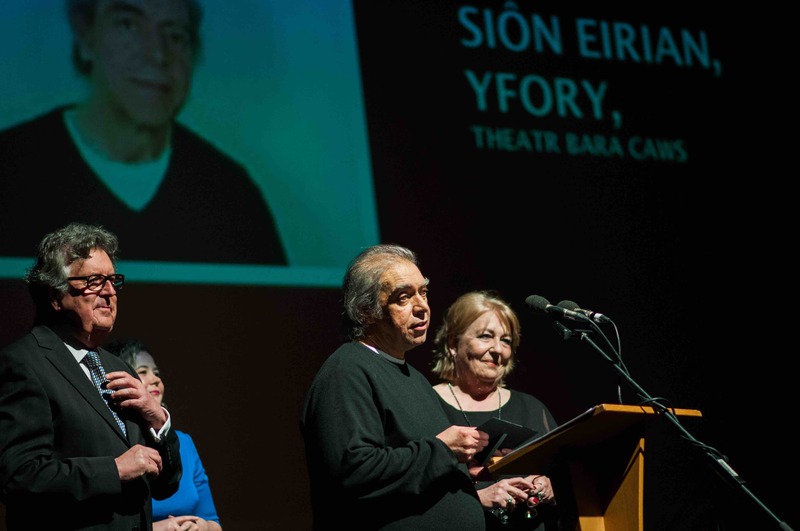 The Best Actress in the Welsh Language was named as Caryl Morgan for the Theatr Bara Caws play Yfory. 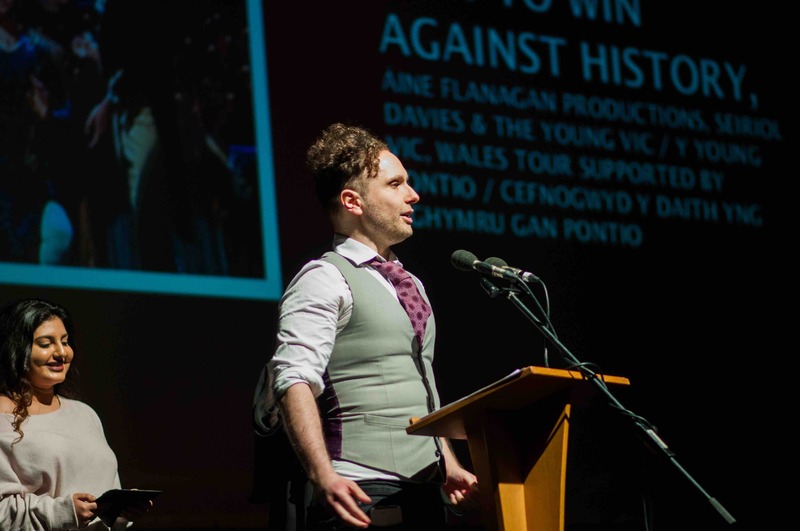 Its writer Siôn Eirian won the Best Playwright in the Welsh Language. The new Welsh language opera, Wythnos yng Nghymu Fydd, was named as the Best Production in the Welsh Language. The Gareth Glyn and Mererid Hopwood work, based on the Islwyn Ffowc Elis novel, was toured extensively by Opra Cymru. The English Language Best Actor Award went to Sion Daniel Young for the Sherman Theatre and Royal Court Theatre co-production of Killology. The play’s writer, Gary Owen, was named Best Playwright in the English Language. 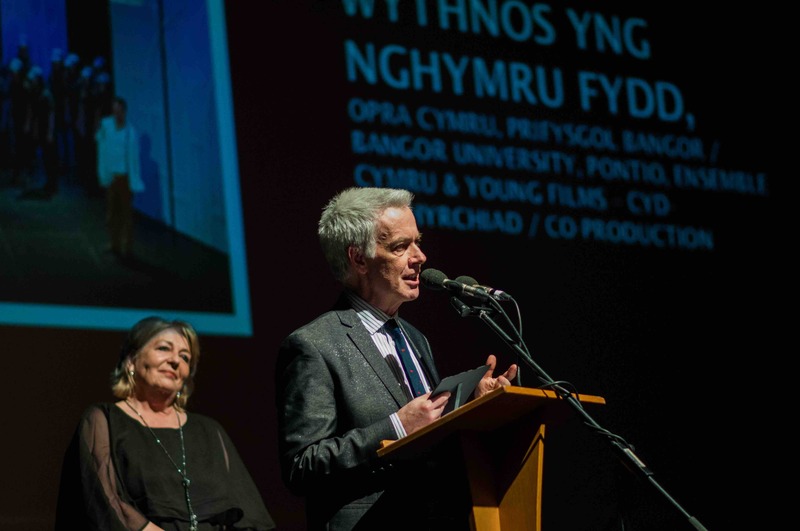 This year’s new categories include best touring production – in Welsh and in English – to recognise the importance of work that is seen throughout Wales. 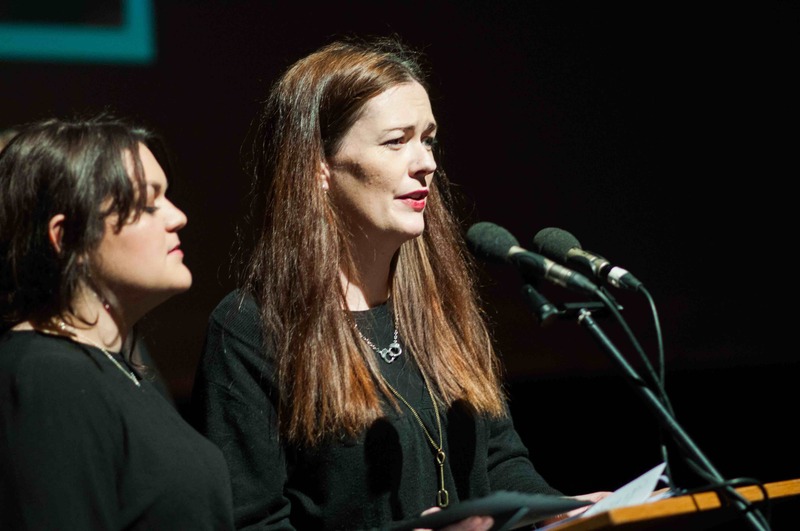 The inaugural English Language winner was How to Win Against History – produced by Aine Flanagan Productions, Seiriol Davies and London’s Young Vic. Before sell out performances in London before Christmas the show toured Wales, supported by Pontio, Bangor, Gwynedd. The musical about the Fifth Marquis of Anglesey has its genesis in North West Wales. 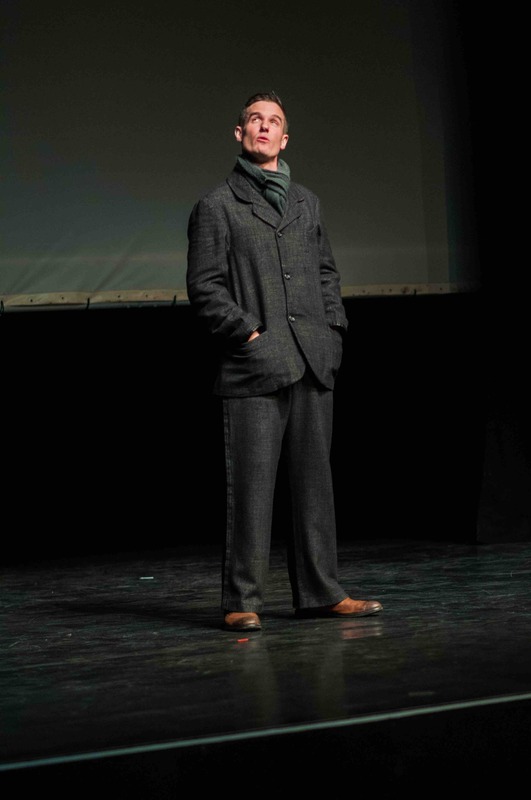 The Welsh touring production winner was Rhodri Miles for his show Sieiloc, taking a fresh look at the story of Shylock from Shakespeare’s Merchant of Venice. Also new, The Wales and the World Award recognises Welsh work performed abroad was presented to Daniel Llewelyn-Williams for A Regular Little Houdini. Telling the story of a boy’s life in Newport, when the great Houdini visited the then bustling port. The story was inspired by the Newport-born writer / actor’s father who passed away late last year as Daniel was taking the show to New York. 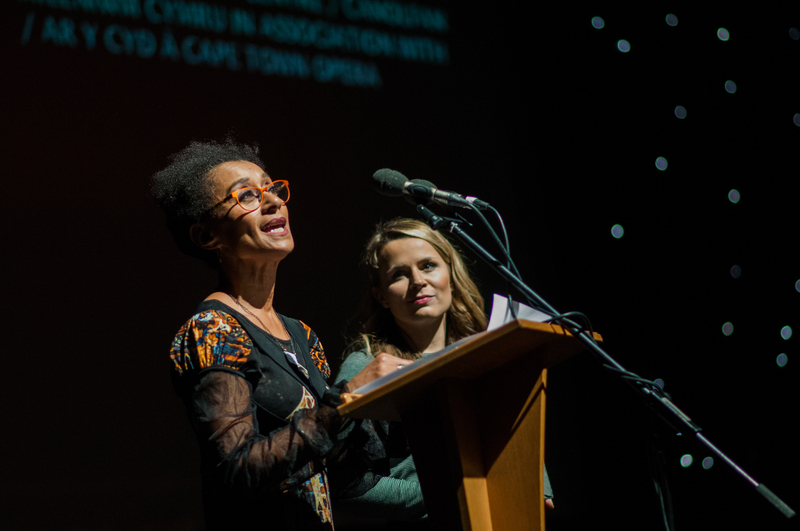 The cast of Wales Millennium Centre and Cape Town Opera’s musical Tiger Bay was named Best Ensemble. Members of the cast including Suzanne Packer, Vikki Bebb and Dom Hartley-Harris accepted the award for the show which told the story of the Welsh capital at the turn of the 20th century. 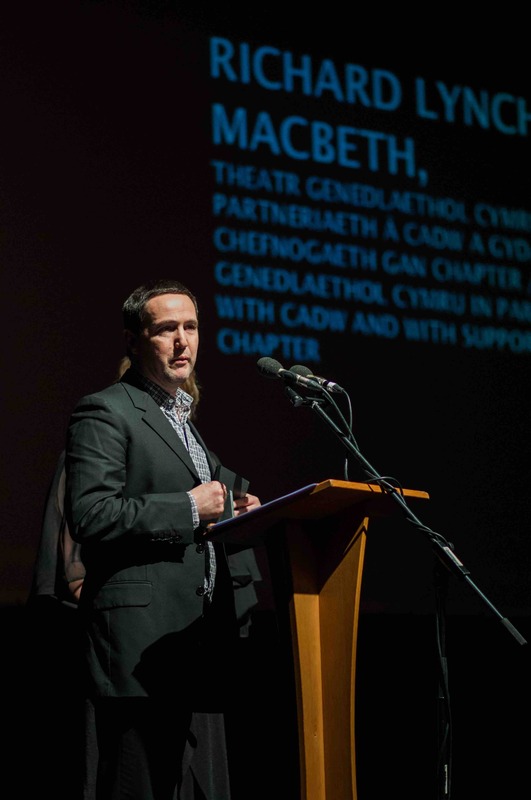 Awards director Mike Smith said the new touring awards recognise “the importance of touring to the cultural life of Wales. As well as the particular challenges presented by taking work throughout the nation, while the Wales and the World Award marks the contribution of a company or individual who takes work created in an outwards looking Wales to an international audience”. The inaugural Best Choreographer award went to Marcos Morau from Valencia for Tundra, created on National Dance Company Wales. 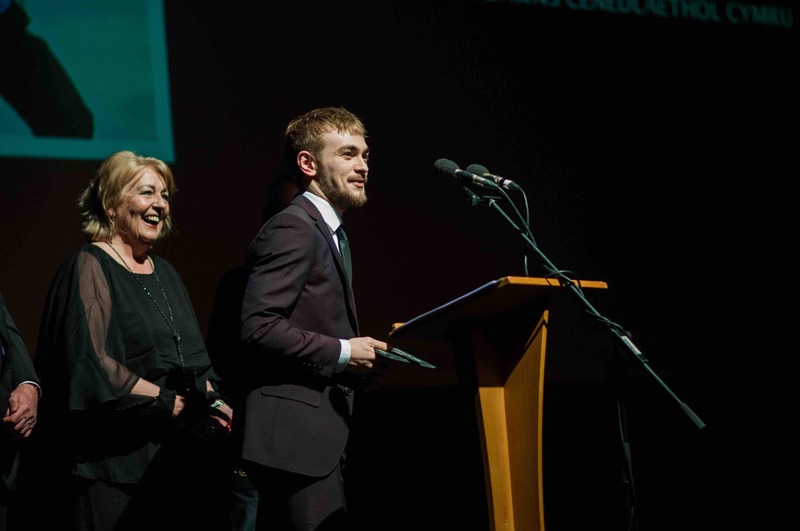 NDCWales’ Ed Myhill was named Best Male Dancer for his performance in Animatorium, choreographed by Caroline Finn. 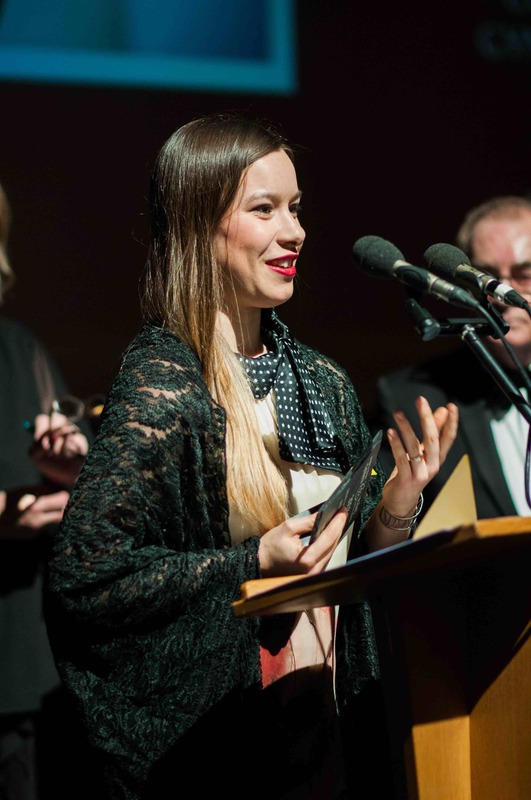 The Best Female Dancer award went to Anna Pujol from Blanes, Spain for the Ballet Cymru production The Light Princess, co-produced by Ballet Cymru, Catrin Finch and The Riverfront. Anna flew in from Spain to accept her award. Ballet Cymru also picked up the award for Best Dance Production for Shadow Aspect, choreographed by Tim Podesta and starred Guest Principal Dancer of the Royal Ballet, Mara Galeazzi. 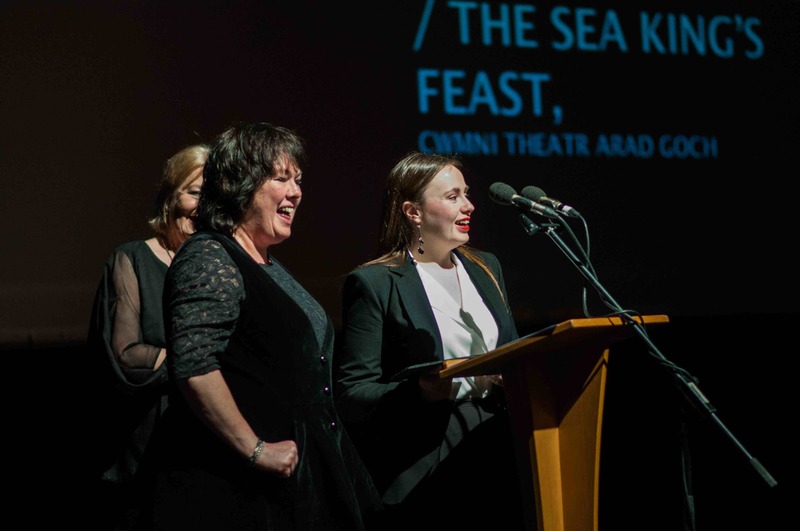 The Best Design Award was won by Buddug James Jones and Anneliese Mowbray for the large seafront festival Gwledd Gwyddno / The Sea King’s Feast by Cwmni Theatr Arad Goch. 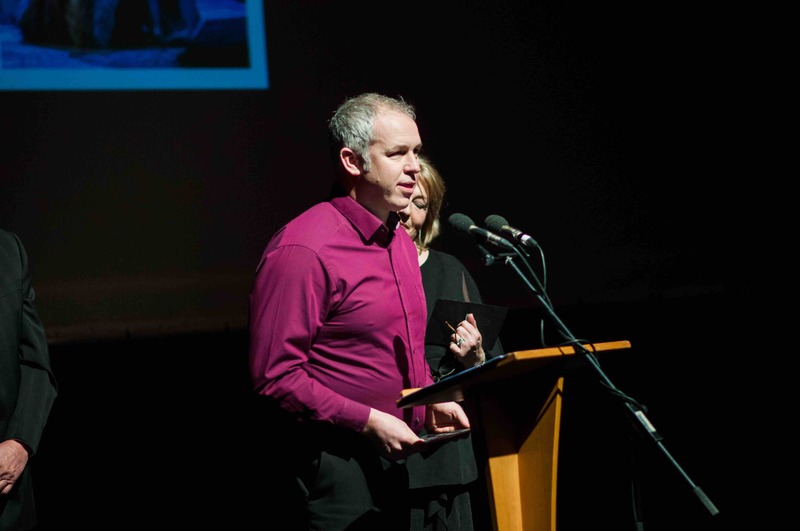 Recognising the work of companies for young people, the Best Show for Children and Young People (English Language) was won by Eye of the Storm by Theatr na nÓg and Cwmni’r Frân Wen received the Welsh Language award for Mwgsi. All three opera awards were won by Welsh National Opera. 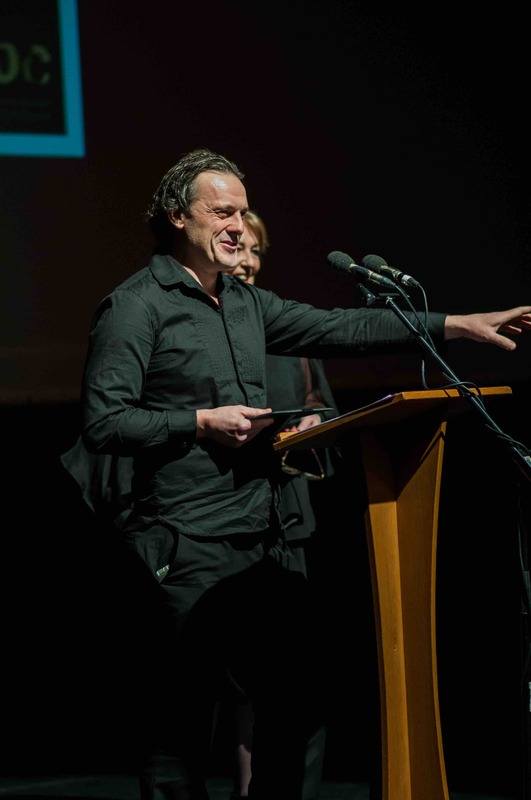 Simon Bailey flew in from Frankfurt to pick up his award for Best Male in an Opera Production for Janacek’s From the House of the Dead. WNO director Matthew Holmquist accepted the award for Frank Martin’s Le Vin herbé. Swansea-born soprano Natalya Romaniw sent a video message from Brno in the Czech Republic where she is performing Lisa in Tchaikovsky’s Queen of Spades, thanking the critics for naming her Best Female in an Opera Production for her role singing Tatyana in Eugene Onegin, also by Tchaikovsky. The Show hosts Nicola Heywood Thomas and Arfon Haines Davies, always popular with the enthusiastic Awards audiences, thanked the host venues and sponsors, performers, organisers an congratulated all who had reached the coveted shortlists as being winners and thanked the arts community for their work throughout 2017. 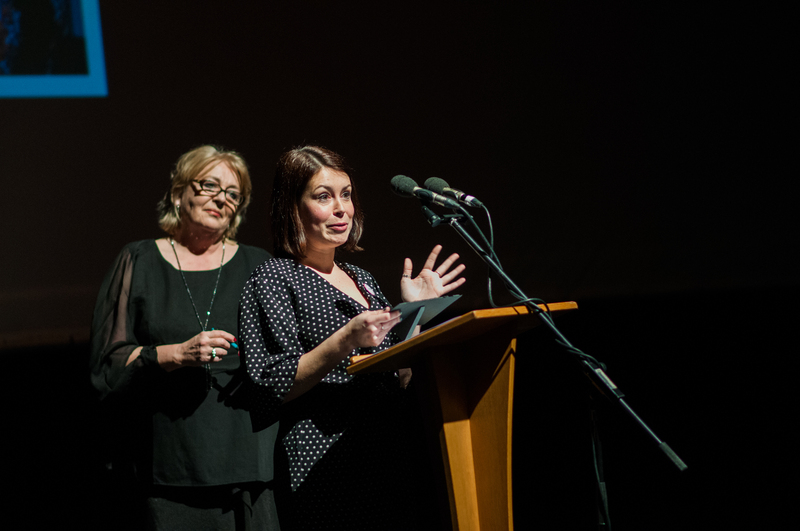 Reminding the arts community to keep late January 2019 clear in their diaries the host presenters suggest it may be time for the Awards Show, which has been in Cardiff, Swansea and Newport, may move further north in 2020.